Always looking for new ideas for food presentation and cocktail service? Join us for this exclusive event and learn how to shop like the chefs at the Boelter Superstore! Whether you're looking for china, barware, cookware or utensils, the Boelter SuperStore has everything a cooking enthusiast dreams of… including a huge selection of cookware, and dinnerware exclusively designed for restaurants and chefs! Now you can buy, use, create and plate with the same restaurant quality cookware, utensils, china, glassware, cleaning supplies and more, used by top chefs and restaurateurs in the industry! Regular business hours are Monday - Friday: 8:30 am – 5:00 pm and Saturday: 9:00 am – 3:00 pm. 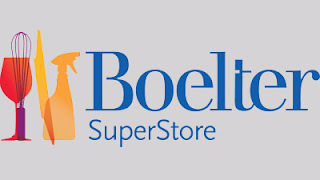 But for this special event, Boelter SuperStore is opening their doors just for us! Demos from Vita-Mix and Lodge Cast Iron Cookware. A special one-night-only 17% discount on in-store purchases! Cheese and crackers will be available for nibbling. To find out more about the Boelter SuperStore, visit them online at www.boeltersuperstore.com. And be sure to like them on Facebook, and follow them on Twitter!